I have watched the alleged gas attack on Youtube. How come only children are affected? Appeal to emotion? Why the people decontaminating are not wearing any protective clothing? Where are the dead from this attack? How can sarin gas be decontaminated with simple tap water? Who is doing the filming? Who is verifying? What benefit could Assad have from all the negative response and an attack from the world? I am skeptical about this. Looks like a Pallywood production. Ariel, the first photo in your post is from the Iranian incident where American navy was detained. Someone is reusing old photos. Beware of propaganda. pr126 wrote: Ariel, the first photo in your post is from the Iranian incident where American navy was detained. Thanks for the warning PR. I am angry. Angry at myself, and angry at Trump. But I am more angry at myself, because of my trust in Trump. I believed him when he said he want peace and nor war. How stupid I have been to believe him. Leave it to John McCain to keep the drums of war beating. He won’t be satisfied until the secular Syrian government is overthrown and his jihadist buddies declare a new caliphate from Damascus. Sen. John McCain (R-Ariz.) on Friday praised President Trump for ordering airstrikes in Syria, but cautioned they do not make up for a lack of strategy. “I applaud the president for taking military action against the Assad regime for its latest use of chemical weapons, and for signaling his resolve to do so again if these heinous attacks continue,” McCain said in a statement. Earlier Friday night, Trump announced that he ordered “precision strikes” against “targets associated with the chemical weapons capabilities” of Assad in retaliation for last weekend's chemical attack in the Syrian town of Douma. The operation, which came after a week of deliberation, was carried out in coordination with Britain and France, leaders from the countries said. McCain, chairman of the Senate Armed Services Committee, has long advocated for a more robust U.S. military response to the Syrian civil war. He’s also repeatedly knocked Trump for not having comprehensive strategies for a slew of global hotspots, including Syria. In his statement Friday, McCain thanked Britain and France for helping in the operation and said he hopes Assad gets the message. Ariel wrote: There is no proof Assad did it Hombre. How much I love Israel, and stand behind them, I still want to be honest and fair to Assad and his people. Trump is ( perhaps ) going to attack Syrie to appease Israel. Please read this thread and the comments, and look at the pictures. .
Sadam Hussein & Assad own father also claimed the same "There is no proof" when they gassed their own people in the 1980 & 90's. Eva Bartlett is just another individual like you and me who expresses her own opinion, and she is entitled to - though not necessarily true. Much like uber-conservatives in US claim "Deep state conspiracy to remove (the way they put it) our duly elected president". Israel does not need - nor ever asked anyone else to handle Syria, Hizbollah, Hamas, and even Iranian forces in Syria for it. (Iran's nuclear program is a different story). As we have seen, IDF is doing a fine job defending the country. pr126 wrote: I have watched the alleged gas attack on Youtube. There is something about this story that bothers me... In any crime, if you are looking for the culprit, you would want at ask "who benefited?" As I understand it, Assad was on the verge of taking this area from the "rebels" when the attack happened. So how did it benefit Assad? The answer is it obviously did not. Also, any halfway intelligent person would realise that such an action could and would not help Assad's case. Who was actually helped? Well, this seems to be the rebels. They have turned Assad even more into a pariah if that is possible, and most importantly they got Trump and others to fight their battles for them. This certainly makes them, at least for me, a much more plausible suspect for the attack. manfred wrote: There is something about this story that bothers me... In any crime, if you are looking for the culprit, you would want at ask "who benefited?" I agree. I am of the same opinion. Hombre wrote: Sadam Hussein & Assad own father also claimed the same "There is no proof" when they gassed their own people in the 1980 & 90's. Hafiz al-Assad is long dead Hombre. You are cheating. We are discussing his son Bashar al-Assad. Who benefitted? There is one possibility to be considered. It is not beyond the possibility that Russia was behind all this. Perhaps Russia encouraged Assad to perpetrate this evil deed as he had nothing to lose beyond what people already thought him to be. 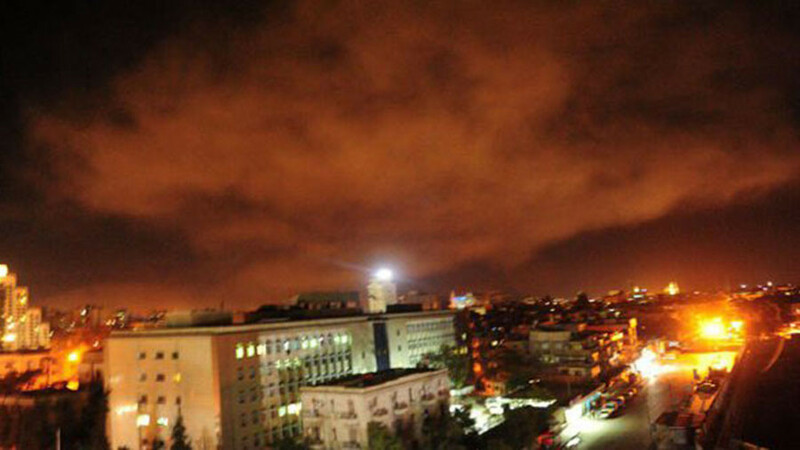 If Assad was behind this gassing then Russia must have known and given consent for it to happen. Why? Russia could have been testing Trump`s resolve and seeing if he was another Obama - full of talk about red lines and no action. 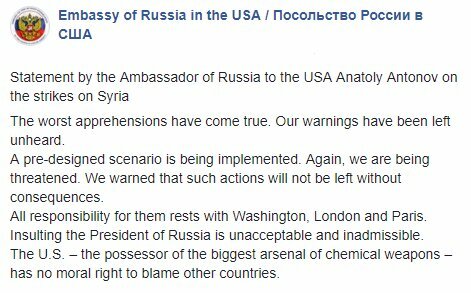 It appears that Russia was warned about what was going to happen ie just the WMD plants being attacked and not Assad or the military. This would give insight into the ability of the USA`s strike force without endangering Russian "advisors", Assad, his military or the Syrian population. I do not think that Assad has lost much at all regarding his "popularity" but Russia has gained insight into the effectiveness or otherwise of the USA`s military. I think that the White Helmets and the rebels were behind all this. What do you think sum? As a cardiologist I can say that these ECG electrodes are completely wrong positioned. They would not get any signal. This picture is faked! As far as who is actually behind all this, I do not know. I am not too sure how the chlorine was delivered - was it by barrel bomb? If it was I have to ask if the rebels, or whoever, had access to helicopters? If it was those who were opposed to Assad then why did not Russia kick up a fuss right at the very beginning? With regard to the ECG, I`m afraid that the photo is not very helpful at all and I can only presume that the cardiologist must have seen something that was not clear to me. Secretary Mathis was asked what kind of gas was used by Syria. He finally admitted that they had used Chlorine. Now chlorine can be manufactured in large quantity by a chemist with little training. It's common ingredient of tear gas as well as seawater ! Chances are Syrians may have used tear gas and saturated the place with gas which could have killed civilians. Assad regime is very very brutal but it enjoys support of all religious minorities as it fights Isis. Like father like son. Bashar carries his father's genes, and lust for murder of innocent people. 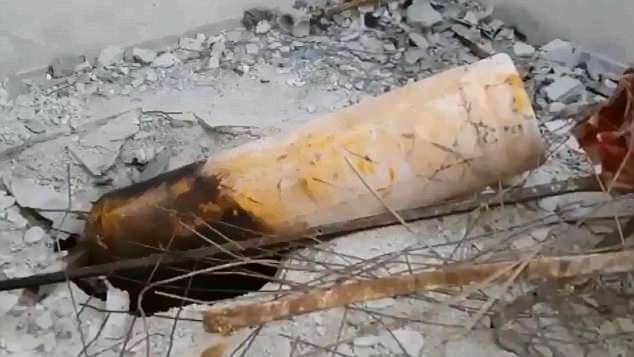 The Mail on Sunday today claims that the French have proof the Assad was to blame: the White Helmets have produced a photograph of a chlorine cylinder on the roof of a bombed building. How this is supposed to fit with the chlorine being delivered by barrel bombs, I don't know - gas cylinders are very strong and are regularly thrown about in yards without coming to any harm unless the tap is damaged. On the other hand, if I wanted to gas the occupants of a building, getting onto the roof with a cylinder of chlorine would be a good start. If I wanted to fake an attack, an empty cylinder would do. 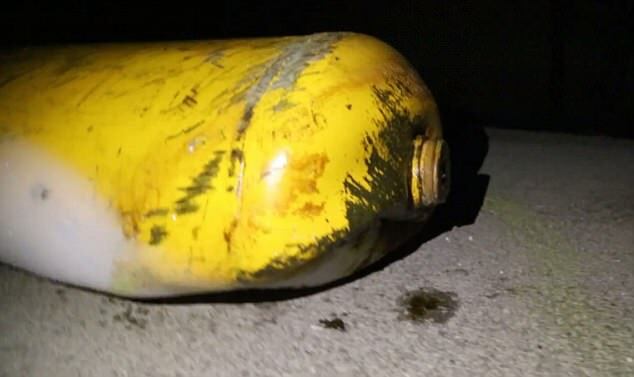 Another photo of a related incident shows a cylinder that appears to have been squashed - quite an achievement. Hi sum, dropping chlorine in a bomb would be not very efficient as the blast would quickly disperse it. As a gas, it HEAVIER that air. So it would linger on lower surfaces and "slosh around" for a while, and this would explain why seeming children are more affected than taller adults. It was used in WWI precisely because of this property... it would collect in the trenches. It was then released from slightly pressurised containers which were pointed at the enemy, when the wind was right, and simply pierced. It can be produced easily and cheaply: In the middle of the vat, glued in, is a porous separation made from a piece of asbestos. Fill both compartments with sea water and seal the whole thing. Allow a plastic pipe as vent on each side of the contraption. When the asbestos is saturated, and the sea water in both compartments are in contact, run some electricity through it, direct current, say from a car battery. From the positive half you can collect chlorine, and from the negative one hydrogen. If you add cooking salt to the seawater you get a better yield. An even simpler way uses just a sealed container with a single vent on the top, and salt water, if you pass electric current through that you get a mixture of hydrogen and chlorine, equally effective as an irritant gas. As a means of delivery, it would have to be delivered from the ground. Delivering with any sort of bomb, it the heat would make the gas not only disperse very fast, it would also largely react with anything else it comes into contact with, specially any chalky substance such as plaster, rendering it harmless. The photos Ariel provided actually strongly support the suggestion that it was delivered from the ground. Look at the containers. They have not been in any explosion. This raises another question.... Who could actually place these containers there? You would to have control over the area they are found in, and the range is at best a couple of hundred yards. So unless we also have some evidence that Assad's forces were actually in physical control of the ground the containers were found, at the time of the attack, we must rule out Assad as the possible culprit.